Religious tensions involving Muslims have surfaced in the Russian capital over the past decade – partially due to a huge influx of migrant workers from Central Asian states. 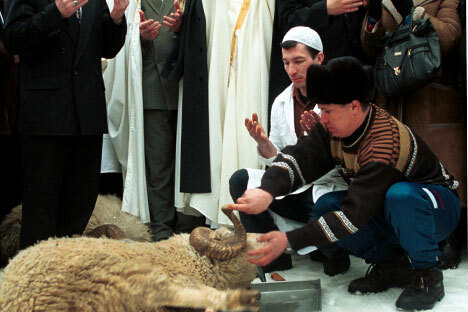 The Moscow Department for National and Religious Policy has reminded Muslims that the sacrifice of animals on the forthcoming holiday of Bakri Eid or Kurban-Bairam as it’s called in Russia should be done only at dedicated sites outside the city limits. The head of the department, Yuri Artyukh, announced the official position at the recent meeting with representatives of the Muslim communities dedicated to the celebrations of the holiday, which falls this year on October 15. “The participants of the working meeting again confirmed the unacceptability of performing the rites of sacrifice in the city. All city mosques are accepting orders for the meat from animals that would be slaughtered at specially agreed and equipped sites in the Moscow suburbs,” reads the statement posted on the website of the Council of Russian Muftis –an official body coordinating the affairs between the state and those who follow the Islam. Religious tensions involving Muslims have surfaced in the Russian capital over the past decade – partially due to a huge influx of migrant workers from Central Asian states. According to the city police, about 150,000 people took part in Eid Al-Fitr festivities in August this year. Over the last few years, objections against Muslim rituals have grown as believers have been caught slaughtering sheep for the holiday right on the street near apartment blocks or, sometimes, in the balconies of apartments. In 2010, the city authorities responded to complaints filed in by activists and banned the sacrifice within the city limits. The believers were offered two options: either ordering meat from animals that would be sacrificed outside the city in accordance with Muslim rules, or performing the rituals themselves, also at the out-of-city site where the believers could go by special community buses. The authorities are currently taking the regulations one step further – in January this year the Russian Ministry of Justice proposed a set of amendments to the Freedom of Conscience Law that would make illegal any unsanctioned prayer services and rites held outside religious sites or cemeteries. Currently, worshipers are allowed to hold religious ceremonies in public places if they inform the local administration in advance about the planned gathering. The Russian parliament is expected to consider this bill in October this year.